I want to let you guys know that we are planning to offer a mainline packaging variant for the brachiosaurus for international territories, meaning that retailers around the world will be able to carry the brachiosaurus, even if they have not previously taken anything from the legacy collection. this is still, at the end of the day, up to the buyers and the retailers themselves to support these items at the local level, but know that we have heard you and we are doing everything we can to make it possible for people around the world to own and enjoy all of our dinosaurs. Update #1: Mattel’s official Jurassic World Instagram just released our first look at the actual Brachiosaurus toy! There’s no denying the immensity of this figure, we can’t wait to see more! It was just a few weeks ago we were brooding about the possible end of Mattel’s Jurassic World Legacy Collection label, but it would now appear the retailer-exclusive toyline will continue through 2019 while hosting one of Mattel’s most anticipated figures. 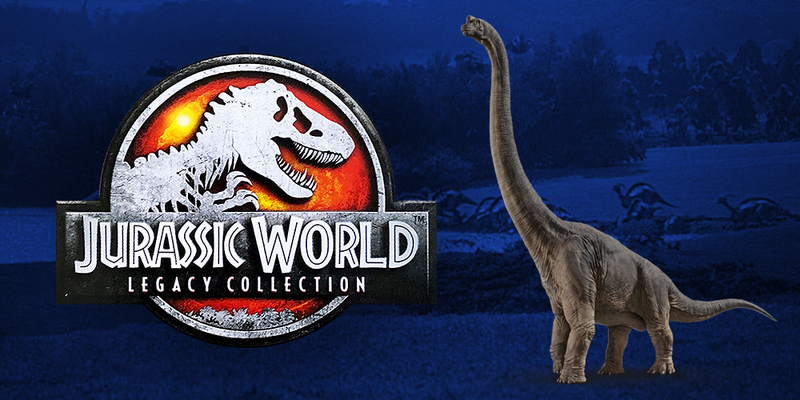 We can confirm the mega-sized Brachiosaurus is slated to release as a Target-exclusive Legacy Collection figure in the US. While international release information is currently unknown, fans worried about another Spinosaur-sized botched release in the US should rest easy: we hear Mattel and Target are both committed to doing right by the Brachiosaurus and have learned from these past mistakes. With the confirmation that this classic Jurassic species will be coming to the Legacy Collection, we can only speculate that its color scheme may align more to the first movie’s aesthetic. Will Mattel’s Brachiosaurus feature slime-sneezing action? Will it electronically bellow mournfully as it is consumed by volcanic gas? We may have to wait a little longer than the upcoming New York Toy Fair to find out, as retailer exclusives are traditionally not shown at the event. Disappointing, yes, but more details about this coveted figure are set to be revealed very soon. Thanks for the heads-up jptoyz! As long as the Brachiosaurus sees much wider release I’m okay with it being a Legacy toy. It’s cool to hear the Legacy series is continuing, as there’s definitely quite a lot of film-specific dinosaurs and characters that’d be neat to see get their own toy. So this means that it wont be an online exclusive like spino?